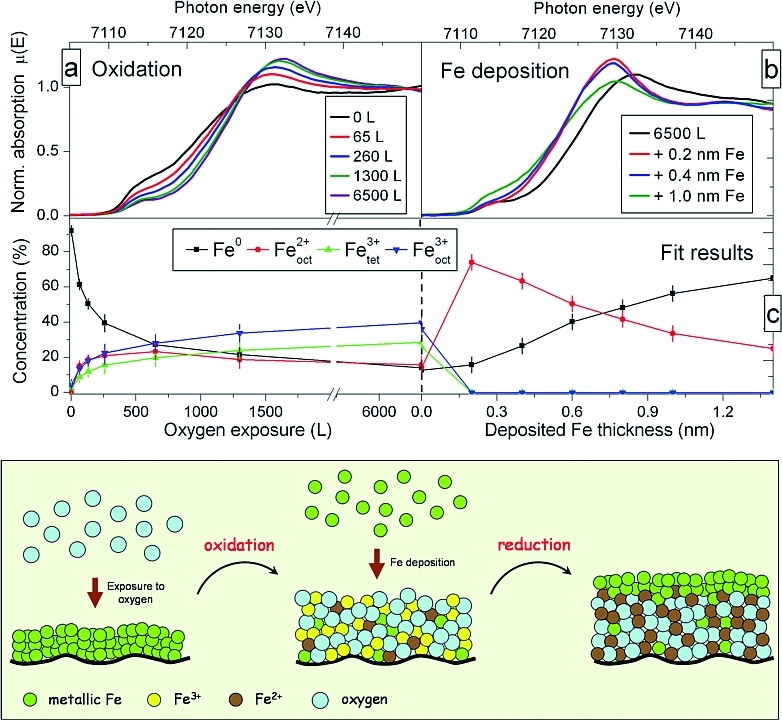 Published as: “How Metallic Fe Controls the Composition of its Native Oxide”, Phys. Rev. Lett. 101 056101 (2008). What happens to an ultrathin film of iron oxide when metallic iron is deposited on top of it? We have investigated this question by X-ray absorption spectroscopy performed in-situ during the deposition process. Typically, the native oxide is a non-stoichiometric mixture of different Fe oxide phases, containing even some Fe atoms in a metallic-like state. 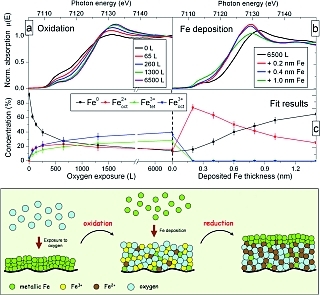 Deposition of metallic Fe on such an oxide leads to a reduction of the higher-valent oxides, leaving only iron atoms in a FeO-like phase. This approach allows one to prepare nanometre thin films of single-phase FeO. Further studies show that the Néel temperature of such FeO films is significantly enhanced compared to bulk FeO, and that its magnetic properties lead to remarkable coupling effects between two adjacent metallic Fe layers. The oxidation of iron surfaces has been extensively studied in the past  due to the wide use of iron in technologically relevant systems. It was recently shown that nanometre thick native-oxide layers (produced by exposure of metallic Fe to oxygen) can be used as building blocks in new magnetic structures . For example in multilayers consisting of alternating Fe and Fe-oxide layers, the magnetic moments of the Fe layers are arranged in a non-collinear fashion . Understanding these remarkable magnetic properties requires a precise knowledge of the structure and composition of the oxide layer formed in the oxidation process. This is particularly important because there exist different crystallographic sites for the Fe atoms in the oxide phases, resulting in strongly structure dependent magnetic properties. One method to study the oxidation state and the local symmetry of atoms in solids is X-ray absorption spectroscopy. The near-edge structure (XANES) depends directly on the oxidation state, and the extended fine structure (EXAFS) includes information on the local symmetry. To understand the change in structure and chemistry at every step of the growth, the analysis was carried out under well controlled conditions in a dedicated UHV chamber . Figure 1: (a) Evolution of the near edge spectra (XANES) of a thin (0.8nm) Fe layer exposed to an increasing amount of oxygen. The progressive shift towards higher energy indicates an increase of the oxidation state of the Fe atoms. (b) Upon deposition of Fe the spectra changes dramatically and adopt a shape never observed during the oxidation procedure. (c) Quantitative analysis shows that, in saturation, the oxide is a mixture of different Fe sites. 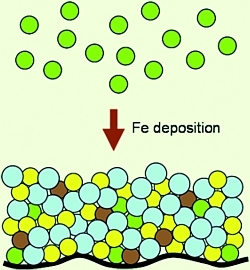 After deposition of Fe, the layer reduces to a pure FeO-like phase. The lower panel summarizes the oxidation and reduction processes. The experiment was performed at the A1 beamline of the DORIS III storage ring. Extreme sensitivity, down to the monolayer regime, was achieved using a total electron yield detector. First, a thin layer of iron (0.8 nm) is sputter deposited on a silicon substrate (capped with a Pd buffer-layer). The Fe K-edge absorption spectrum shows a clean metallic iron surface (Fig. 1a). Then, the layer is oxidized by controlled introduction of molecular oxygen into the vacuum chamber. The absorption edge shifts towards higher energy, indicating the progressive oxidation of the layer. Above an exposure of 1300 Langmuir (1L = 1x10-6 Torr · s) only little changes are still visible in the XANES spectra, indicating that the saturation regime is reached. The oxide growth virtually stops. Quantitative analysis using different oxide reference spectra shows that all types of oxides are growing at the same time during the oxidation process. In saturation, a complex mixture of Fe2+ and Fe3+ is observed (Fig. 1c). At this stage, it is quite surprising that some of the Fe atoms remain in a metallic state, even in the saturated oxide. When only 0.2 nm of Fe (this corresponds to one atomic layer) is deposited on top of such an oxide layer, the metal immediately oxidises and literally eats the excess of oxygen present in the layer. The result is the formation of a pure FeO layer composed of Fe2+ sites only, the lowest oxidation state of Fe in an oxide phase. The analysis of the extended fine structure (EXAFS) part of the absorption signal, which is sensitive to the local symmetry of the absorbing atom, supports that finding but indicates that the FeO layer formed has a poor crystallinity compared to the bulk FeO phase. These experiments show a rather elegant and easy way to produce nanometre thick FeO layers. This is quite remarkable because pure FeO is rather unstable under ambient conditions, so that other types of iron oxide dominate. The experimental method developed here can be applied to the oxidation process of metals and, in general, to the study of interface formation between reactive compounds. This opens interesting perspectives for in-situ studies using X-ray absorption spectroscopy at modern synchrotron radiation sources.